A scientific work published by researchers from Princeton University and Florida International University revealed that China has more than enough possibilities and motives to “kill” Bitcoin or at least to do considerable damage to the blockchain’s stability. The paper entitled “The Looming Threat of China: An Analysis of Chinese Influence on Bitcoin” elaborates extensively on the love/hate relationship between China and cryptocurrencies. While the government has maintained a restrictive policy against the use of cryptos, mining activity is highly popular in the country. In fact, it is possible to conclude that anti-bitcoin China is responsible for the generation of most bitcoins, and this is an inherent danger according to the authors of the study. The paper details the ease with which a 51% attack could be carried out given that the Bitcoin mining ecosystem is “heavily centralized.” According to researchers “over 80 percent of Bitcoin mining is performed by six mining pools,” of which five are located in China. 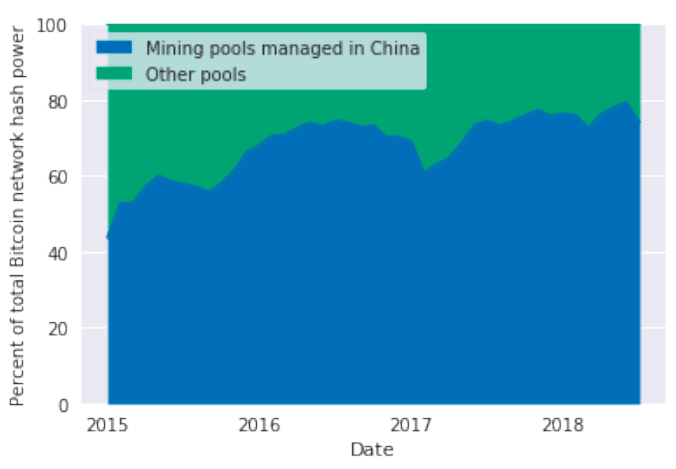 While there is no single pool with the capacity to carry out such an attack on its own, the fact that 74% of the combined mining power is located in China makes it plausible that this attack can be carried out if several pools decide or are forced to ally. The paper classifies possible attacks from Class 1 to Class 4 and illustrates 19 possible ways to strike the network if the government or the miners have sufficient reasons to do so. This situation is not unique to Bitcoin. Other cryptocurrencies such as Bitcoin Cash and similar have also been criticized for being excessively centralized. Even though a review committee has not approved the paper, it is available for community analysis.